Are there any kids out there who don't love a dinosaur story? We seem to borrow endless numbers from the library and each one is different from the last! So when a new story comes along it has to roar pretty loud and stop it's dino-feet to be noticed. 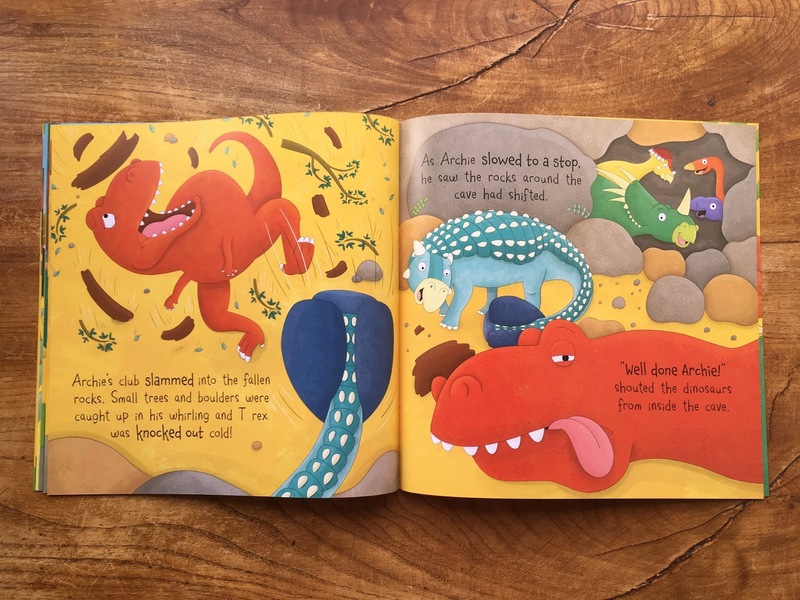 And this new series, from Miles Kelly Publishing, 'Dinosaur Adventures' by Fran Bromage with a variety of illustrators had certainly roared loud enough to get BookBairn's attention. With four in the series and each on focussed on a different dinosaur - T-Rex, Diplodocus, Velociraptor and Ankylosaurus - there's a dino friend for everyone. 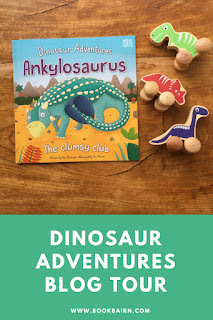 As part of the Dinosaur Adventures Blog Tour - we have been sent the 'Ankylosaurus' book but if you want to check out your kids favourite dinosaur, you can check out the other blogs on the tour, which I have linked at the bottom. 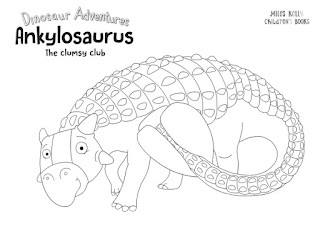 'Dinosaur Adventures: Ankylosaurus' by Fran Bromage and illustrated by Tom Heard tells the story of Archie the Ankylosaurus who has a huge club at the end of his tail. Archie is a very tough-looking dinosaur but he has a really soft core making him super shy. But he's also very clumsy, which is pretty tricky when you have a huge club at the end of your tail, especially when it seems to do the exact opposite of what he wanted it to do! He destroys things just by walking past them. He knocks out and trips up his dinosaur friends and spends a lot of his time saying sorry. 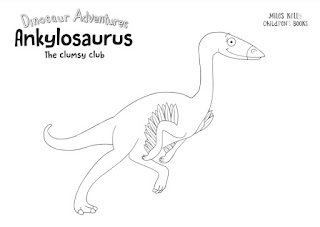 And the other dinosaurs, quite frankly are fed up of getting tripped up by Archie's club. So he often gets left out of games and is left watching as the other dinosaurs as they play. During a game of hide-and-seek, Archie spots a T-Rex heading right their way, and warning all his dino-friends they head for the cave where all his friends were hiding and just as they get to the cave a volcano starts to erupt. As the sky fills with smoke and the fiery balls of lava shot into the air, there is a huge rockfall and Archie hasn't reached the cave.With his friends trapped inside the cave, and a T-Rex on his tail, what can Archie do? Use his club of course! A lovely story about self-pride and overcoming obstacles, it's a great one to read aloud to little readers. The dinosaurs are adorably brought to life in a variety of colours, your little one will want to join the gang! And if you check out our social media you'll see that we have three whole sets of four books to give away! We were also lucky enough to get to ask some questions to the illustrator as part of the blog tour as well as get an exclusive how to drawing guide of Archie and some printable colouring in sheets! How did you find illustrating the dinosaurs? With so much speculation and research as to what they actually looked like were you tempted to give them feathers? I’ve had so much fun illustrating dinosaurs for this book! 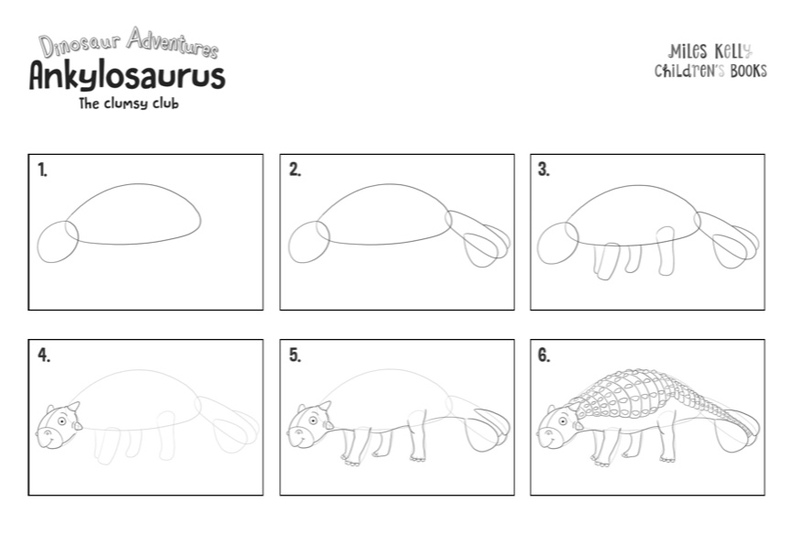 At first, it took some time to capture each dinosaurs’ characteristics and their were numerous versions before I decided upon my final character designs. I was never really tempted to add feathers, this I believe was partly due to reflecting on the illustrations within my own dinosaur books as a child. Far too many to name them all! I’ve recently enjoyed Quick, Barney, Run! by Pip Jones and Laura Hughes and some of my favourites include The Bear and the Piano, (David Litchfield) and The Lost Thing, (Shaun Tan). I’m sure there illustrators who have inspired you, can you tell us a few that you like the most? Oliver Jeffers, Yasmeen Ismail, Chris Riddell, and Benji Davies. If you could choose any book to create new illustrations for, which would you choose? What a difficult question to answer! I think it would be Matilda by Roald Dahl, a book I’ve read countless times and the characters would be good fun to illustrate! "My favourite dinosaur is a triceratops. Which dinosaur do you like best?" My favourite dinosaur is a T-Rex they are huuuge! My best colour is blue after the greatest football team in the world – Birmingham City! My favourite animal is a dog, after my pet Labrador – Buster. I’m currently drawing pirates, ships and lots of treasure! BookBairn isn't really at the drawing stage yet - though she can do a very good impressionist style picture of me (where all my limbs come out of my head!). But we had so much fun using the colouring-in sheets. I coloured Archie and she coloured two of the other characters from the story and she concentrated really well on the task. She was pretty determind to choose her own colours for the characters and not just copy them. She chatted away as we worked side by side and I'm definitely going to do more side by side colouring and artwork with her. 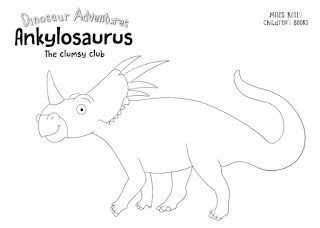 If you would like to get your hands on your own colouring sheets to match the characters in the story simply click on the images below to find them. And just one last goodie for you today! 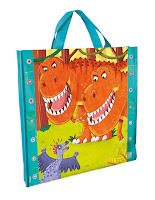 We are giving away three gift bags - each with the four Dinosaur Adventures book, a colouring book and a puzzle as well as this irresistible dino bag! So pop over to any of our social media - Facebook, Twitter and Instagram as we will be giving away one bag on each platform! To find out more about the series check out the rest of the blog tour below or pop over to Miles Kelly Publishing. There are so many great goodies as part of the blog tour so well worth checking out the other bloggers social media accounts for more freebies and giveaways! What an exciting blog tour this has been! 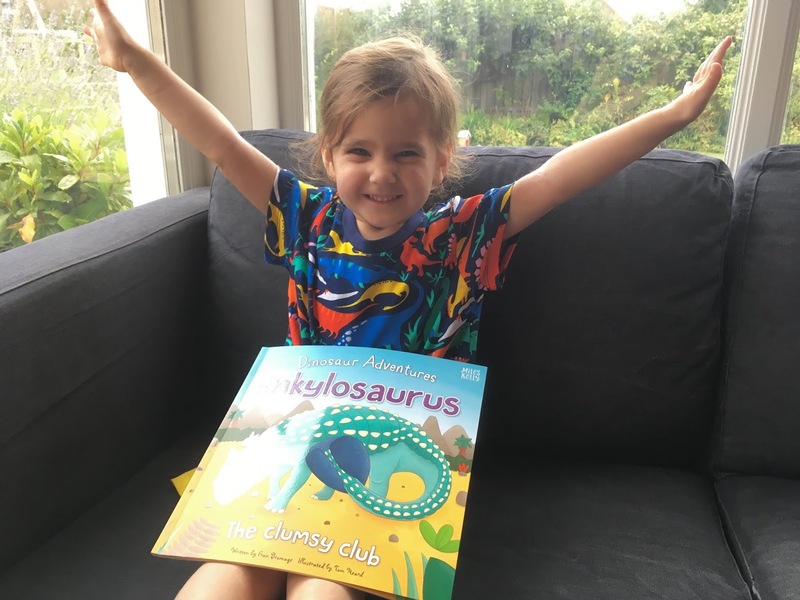 Happy reading, drawing, colouring, winning and dino-stomping!! 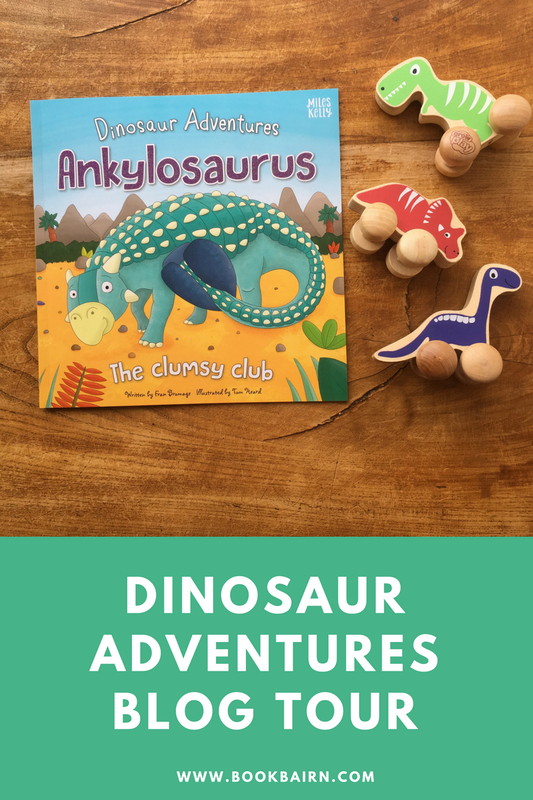 DISCLAIMER We were sent our copy of Ankylosaurus and have been promised a goodie bag of our own in exchange for taking part in the blog tour. As well as being provided with the goodie bags to give to you! Words and opinions are our own. Great book. Great interview. Great giveaways. Well done. Thank you! And great colouring in!